Editor’s note: This article has been changed to clarify that Amy Silverman was a reviewer and not one of the book’s authors. We also highlighted three LGBTQ authors of the book. 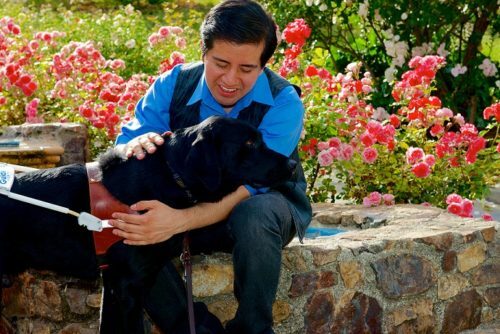 A gay man who was mutilated in a 2011 attack has taken the tragedy that left him blind and turned it into an invaluable opportunity for others. Meet Belo Miguel Cipriani. The life-altering incident occurred when Cipriani was just 26 years old. The San Francisco resident was bashed while walking through the Castro District. The attack was never designated a hate crime. In fact, it’s not clear even now what exactly happened and why, but one thing was crystal clear: his eyes were nearly kicked out of his head. While searching for insight, Cipriani decided to write a memoir about his experience in that moment – and also in finding his voice as a gay blind man in a new dark world. In Blind: A Memoir, Cipriani recalled his lessons as he navigated the tasks of walking, cooking, reading, and writing through a place of pure darkness. Through it all, he chose the light. Still, there was something more than met the eye with his experience. “Other parts of the book helped me to recognize my physical and spiritual growth,” he recalled. Now, Cipriani is funneling that same drive and grit toward helping other people with special needs and different abilities. His Minneapolis based company, Oleb Books, seeks to empower the disenfranchised and expand representation of disability in literature by publishing disability stories by writers with disabilities. The company’s first literary release is titled Firsts: Coming of Age Stories by People with Disabilities and will be released October 2018. There are three LGBTQ authors in Firsts: Coming of Age Stories by People with Disabilities. David-Elijah Nahmod wrote “Star Worlds,” which is about the PTSD he suffered as a result of being committed to a psych ward in a New York hospital as a child on the advice of an Orthodox Jewish rabbi who said that was the thing to do with a hyperactive child. Caitlin Hernandez wrote “Landmines,” which is about how as a blind gay woman she yearned for something more from a man who had become a good friend over the years. Andrew Gurza wrote “Baring It All,” which is about his struggles as a gay man bound to a wheelchair, and his yearning for a relationship with someone who sees past his disability. Silverman is a commentator at KJZZ, the NPR member station in Phoenix, Arizona. She is also the author of My Heart Can’t Even Believe It: A Story of Science, Love and Down Syndrome. In addition to being the founder of publishing house Oleb Books, Cipriani is also the CEO and founder of Oleb Media – an ADA compliance firm. Cipriani has served as an accessibility and recruiting consultant for Fortune 100 companies, including Apple, Google, Toyota, Facebook, and Wells Fargo.